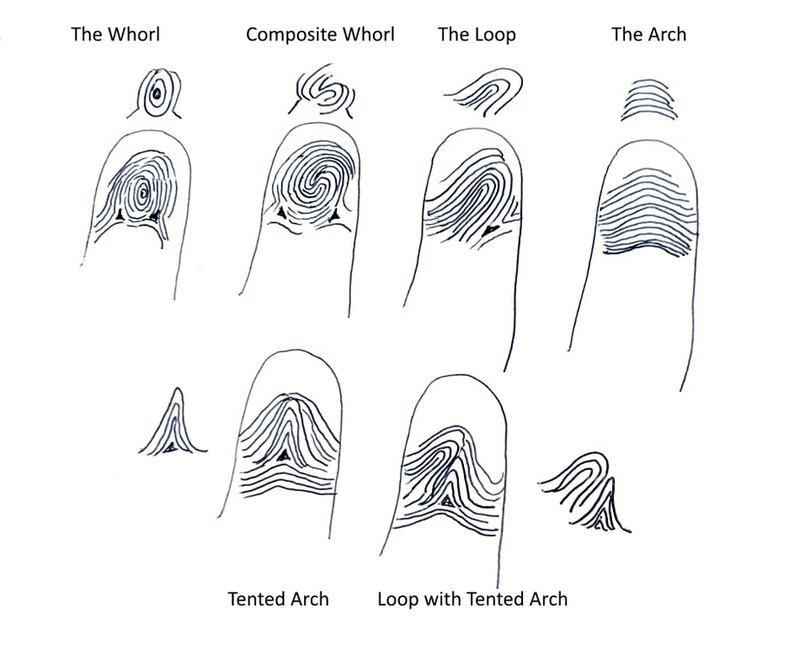 In this article, I mention the fingerprint meanings of the loop and the whorls. There are four basic categories of fingerprints; whorls, loops, arches and tented arches. The four categories of fingerprints can each have many variations. Sometimes we find a pattern which doesn’t seem to fit into any of them, such as a double loop which can at first glance look like a composite whorl. When this happens, it is essential to examine the triradius. A triradius is a ‘Y’ shaped pattern of ridges that split into three directions, usually found on one or two sides of the print. If there is only one triradius it is a loop, with two triradii, it is in the category of a whorl. To get a basic understanding of how to read fingerprints overall, merely combine the qualities of the fingers to the meaning of the print. (watch video about the meanings of the fingers here. )You can then potentially see where their talent or development lies. The central part of the fingerprint pattern is where we can analyse its form. If the shape appears to be high up on the tip of the finger, it can show someone who is mainly the intellectual type. If the pattern is lower on the fingertip, towards the top crease, it can denote a more practical person. Loops are the most common patterns and are recognised by their distinct loop formation with a single off-centre triradius on one side. The average loop points towards the thumb side, (opening away from the thumb) depicting an open-minded nature. Occasionally the loop appears the opposite way with the loop pointing towards the thumb; they are called radial loops. The radial loop changes the connotation of it slightly, the person is very caring and puts others needs first before their own – on the left or non-dominant hand, most likely family, on the right or dominant side, the public in general. If the fingerprints are predominantly loops, (especially if on all ten fingers) there is a great deal of flexibility and adaptability in the persona. They are friendly, easy going and work well in a team environment. They can be committed workers and partners, but at the same time, they are ready for change if necessary, from the many varieties of interests that they have. While they enjoy diversity and freedom, they may lack individuality or struggle finishing what they commence. Whorls have a centre which appears like a full circle, a coiled spiral or an ‘S’ pattern. The whorl always has two triradii, usually one either side of it. Having many whorls exhibits someone who can be focused, determined and responsible, preferring to be in charge. They have a desire to help others; they are individual, independent and highly motivated folk. The whorl being the most condensed pattern, it shows aptitude or growth in an area, for instance, a whorl on the thumb would point to leadership. Someone with at least four whorl fingerprints has exceptional skills or they possess a dedication to a specific cause. However, because the whorl is closed in a circle, it represents a less open and adaptable mindset. Therefore, they tend to be secretive as well as keeping their feelings to themselves. They may also come across as selfish because of their need for space. The whorl, the peacock whorl and composite whorl are the most concentrated print. It represents the strengths of character depending on which finger it is on. If there are no whorls present, the loop ranks as the next highest. However, the focus is not as high, but it still shows the strongest traits, depending again on which finger the loop is on.